When Manchester United and Manchester City take the field this afternoon, it will be 170th time both clubs have done battle. In fixtures gone by, fans of both sets of clubs have seen the likes of George Best, Franny Lee, Eric Cantona, Georgi Kinkladze, Cristiano Ronaldo and Sergio Aguero do battle – with United winning seventy of the matches and City forty-nine. 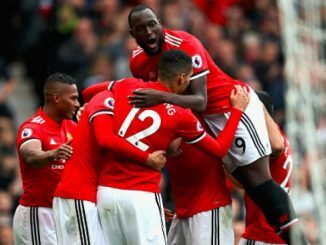 If United are victorious in the derby, they will leapfrog City into second place and could even go top for a handsome win (United will need to win by four clear goals). If the away side are victorious, City will return to the top of the Premier League and put some distance between themselves and United. Wayne Rooney will play his first game for the club at the age of 30 and if he is on the scoresheet will be the 2nd highest goal scorer in the Premier league outright. The United captain is currently joint second with former Manchester United striker, who had a brief spell at Manchester City, on 187 goals. Rooney will have to score a fair few more goals to catch Jimmy Greeves, the all time top goals scoring in English football’s top flight – with 357 goals (Rooney currently in 36th spot). Bastian Schweinsteiger will play in his first Manchester derby today and has spoken of his excitement in the fixture as he didn’t play in too many derbies when with Bayern Munich (citing the poor quality of city rivals 1860 Munich), whilst Louis van Gaal has started with the mind games – stating that Manchester City are favourites going into the match based upon the league table positioning. Morgan Schneiderlin, who was excellent in the 3-0 victory over Everton last weekend, is also full of confidence and says he is good physical shape going into the match. We have a great view from the opposition, with Stephen who blogs over at View From a Blue. We discuss the loss of Sergio Aguero, the performance of Chris Smalling this season and the anticipated arrival of Pep Guardiola at City. 1) Following the 4-2 defeat at Old Trafford last season, I really thought Manuel Pellegrini was a goner. Are you surprised he remained in charge and how do you think he has reacted since then? It’s quite clear that the hierarchy at City want Pep Guardiola to be the club’s next manager, and I guess only the fact he was not available during last summer means Pellegrini remained in charge. Irrespective of any success this season, I’m pretty sure we’ll have a new manager next campaign. There were some moments last year – after the derby or the dire loss to Palace away or following the Champions League struggles – when Pellegrini could have been sacked and not many fans would have shed any tears, but to be fair to him and the players, the last handful of games saw them recover well and finish strongly. Still, it’s probably more down to a lack of alternatives that Pellegrini stayed, rather than a strong end to the season. This year has begun fairly well. The top quality summer signings obviously help and there seems to be a feelgood factor around the club again, but I don’t think anyone has the impression that Pellegrini is here for the long haul. 2) Manchester City have bought ridiculously big over the summer. What have you made of Raheem Sterling and Kevin de Bruyne so far? De Bruyne is simply immense. He has slotted in phenomenally well, playing in a series of different positions and always having a positive impact. Whether it is goals, assists or just his all-round performance, he is a game changer. A brilliant signing and it makes it that bit sweeter knowing Mourinho has been proven wrong in his judgement. Sterling has done well without being a standout performer. We often forget how young he is, and injuries to so many of our attacking players has meant that he has played pretty much every game, so whilst I think he’d benefit from a rest at times, he’s fitted in quickly. His finishing needs work on, but he has given us pace and dynamism in the final third and he will only improve with the quality around him. 3) Sergio Aguero is arguably the best striker in Europe when playing, however how much of a worry are these injuries he seems to pick up every season? They’re a huge worry because he’s irreplaceable. With him being out, we have to operate in a different way and that’s never ideal. He actually seemed to be getting over his problems having changed his diet and the way he trained last year, so it’s unfortunate that his latest injury came with Argentina when he possibly wasn’t fit and shouldn’t have played anyway. I guess he will always have a weakness in terms of injuries, but if we can manage him well and restrict the amount of time he misses, he can still be a huge asset. 4) Have you recovered from the three defeats to West Ham, Tottenham and Juventus earlier on in the season now? Based purely on results, yes. We’ve won the last four games and scored fifteen goals in the process, so we should have plenty of confidence and momentum heading into Sunday. However, performance-wise, it hasn’t all been plain sailing. We have been very fortunate in the Champions League to win the last two games and even during the thumpings of Newcastle and Bournemouth, we have been defensively vulnerable. With better finishing, those two sides could have embarrassed us. Early on in the season, we were winning comfortably and looked incredibly solid. Now, we are winning but look imbalanced. 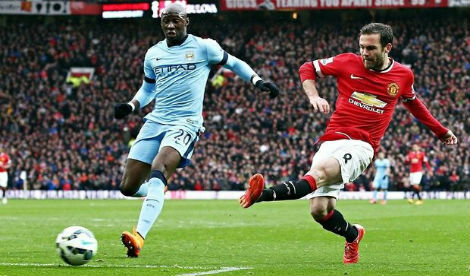 5) Where do you think United will finish this season and is Louis van Gaal building something? I’m sure you know better than I do, but it still seems like the football played under Van Gaal is not what it should be. It appears functional – albeit effective – whereas with the level of talent you have, you should be forward-thinking and exciting to watch. For neutrals, United games are boring to watch. You’ll finish in the top four – Chelsea and Liverpool will see to that – but you won’t win the title. 6) My favourite United City clash at Old Trafford was the 5-0 victory in 1994 – excluding the obvious 6-1 thumping – what is yours? Genuinely, any time we win at Old Trafford it’s a great feeling. Derbies are horrible, so even if we are in brilliant form and United are struggling, I’m never confident. When Darren Fletcher scored to make it 1-3 in the game you mention, I thought you’d manage to salvage a point. Of the recent games, the 3-0 at Old Trafford a couple of years ago was nice to show that the 6-1 result wasn’t a one-off. Also, the 2-0 in 2008 (the Munich derby) saw us win with Benjani and Darius Vassell scoring, and a team that included Michael Ball and Gelson Fernandes. We’ve come a long way since then! 7) Is Chris Smalling the best centre half in England at the moment? Has he surprised you and how good can he become? He’s probably been your best player this season. It’s surprised me to be honest, how well he has done. I never had him down a top defender, more a semi-useful back-up, but he’s done well. 8) Will Vincent Kompany return to the starting line up for the game Sunday? I’d be worried if Kompany didn’t return! I mentioned in one of the previous answers that we have looked iffy at the back in the last few games and that has coincided with Kompany being out. He was shaky last year, but has bounced back this time around and looks as hungry for success as ever. 9) What is your all time City dream team? Man United vs. Stoke City match preview – stick with a diamond or twist to width?